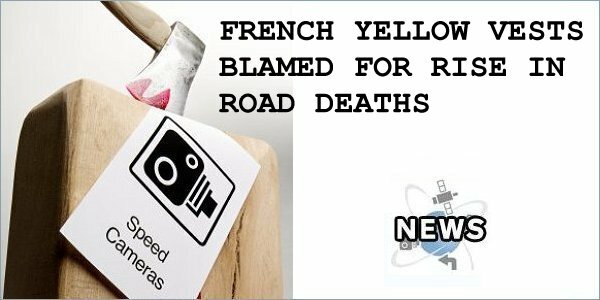 So called "yellow vest" protesters in France have been blamed for a rise of deaths on the roads. They destroyed hundreds of speed cameras (60% of the country's total number of devices) in protest at, among other things, new speed limits - the French government lowered the speed limit on the country's B-roads. There was a significant rise of 17% in fatal road accidents in February. 253 people died, that is 37 more than in the same month last year. The yellow vests movement began in France in November 2018 following an online petition posted in May that attracted nearly a million signatures. The movement is mostly motivated by rising fuel prices, high cost of living, and claims that a disproportionate burden of the government's tax reforms were falling on the working and middle classes. The protests have involved riots, demonstrations and the blocking of roads and fuel depots. Has anyone heard how the government and local councils will fill the financial void left by no speed cameras catching anyone after 2022 speed limiters come in? If your vehicle GTW exceeds 3500kg then the autoroute limit is 90kph when towing. Check the diesel pump bio content as B10 is available as well as B7. The following quote attempts to show reasons for the February increase. In recent months, to explain the poor results, many road safety actors highlight the degradation of the fixed speed cameras as a cause that has led to higher speeds on the roads and therefore the increase in the number of accidents. However, when the number of out-of-service cameras was even higher, the months of November and December saw the number of road deaths drop. For the month of February, the reason for this large increase may be attributed to the exceptional weather that led to an increase in travel, especially since it was a school holiday period. In fact, with more cyclists on the roads with these spring temperatures have been hit hard with 18 deaths, the highest number in the last 10 years. Mortality is also rising sharply for pedestrians. The road safety record for February 2019 is all the more disappointing when compared to the exceptional results for February last year. In comparison with the best results recorded in the same month since 2010, there were 364 accidents and 461 fewer injuries. Only the death toll (216 deaths) was higher than the best results recorded in 2017 and 2012 (204 deaths).